There are four different scales you can use to solo on the blues. You know the A minor pentatonic. Here’s the A major pentatonic scale. …and here’s a backing track. Notice how the bottom staff of the video progression is different than the progression above it. Both are commonly used. Get comfortable with the A major pentatonic scale by playing it with the progression. Like you did with the A minor pentatonic scale, write down stuff you like. You’re probably wondering about the symbols above some of the chords in the blues progression – I7, IV7, V7. Here’s the deal with that. (I’ve addressed roman numerals that deal with major and minor chords here. 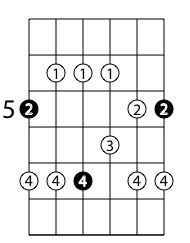 The first chord gets a I; the second chord gets a II, etc. If the chords are 7th chords, we put a 7 after each roman numeral. In a conventional 12-bar blues like the one we’re talking about here, only the I7, IV7, and V7 are used. That’s how you get A7, D7, and E7 for a blues in A. This helps if you want to use the I, IV, and V chords in another key. The key of C, for instance. So the chords for a blues in C would be C7, F7, and G7. And the scales you could use would be C minor pentatonic or C major pentatonic. To be perfectly clear, use C7 instead of A7 in the progression above. Then use F7 instead of D7. And use G7 instead of E7. We’ll look at the dorian mode and the blues scale in the next post.